Mr Charles is a delight! We stayed here for five nights and it was great. It is outside of town, which for us was a huge bonus. It was so quiet and peaceful, tucked between two Shan villages, and on the bank overlooking the river. 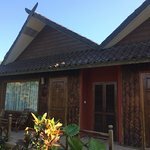 Our bungalow was the nicest accommodation we've had in Burma so far. Sitting on the balcony overlooking the river as the sun sets was incredible. Everything about the interior was magical. Great hot shower! The staff can arrange anything you want to do, and were SO accommodating to our dietary restrictions. 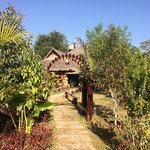 A superb place to stay for a trip to Hsipaw! If you're looking for a little peace of heaven this might be it. 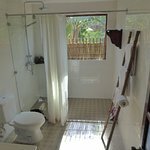 Situated in a Shan village a little outside town it has bungalows with terrace directly to the small river, rooms are nicely decorated, especially the bathroom decor is highly personal. And the service is very personal and friendly too. 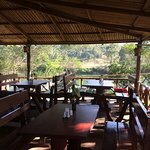 The ambience in the outdoor restaurant is free from easy listening in constant loop with natural sounds like passing boats, crickets and the bells of water buffalos. 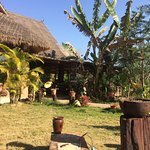 Services like free bicycles, boat trips, trekking tours to nearby hill tribe villages can easily be arranged. And Mr. Charles himself comes to inspect every morning! Great place on the banks of the river about a ten minute drive outside of town. Interestingly, we ran into numerous groups of hikers and cyclists while out walking the back roads to various Shan villages in the area, who had ironically been driven out to the area. Some people don't like the fact that it is a ways outside of town but to us it was a great advantage. 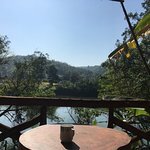 We paid $65US per night including breakfast in January 2017. 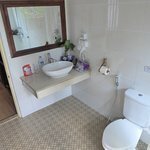 Beautifully finished rooms in a quiet, peaceful location. Breakfast buffet and will cook eggs to order and make you some Shan noodle soup. This was a plus as it is quite foggy and cold in early mornings during winter. Ms. Mimi, the manager, is extremely friendly, fluent in English, and helpful. She drove my wife to a drug store in town when needed. Very professional and does a great job organizing and directing the staff. Highest rating for this gem! My husband and I stayed at this delightful small hotel (11 rooms) for 5 nights recently, and loved every minute. The quiet location is on a small river, about a 30 minute walk from the dusty town. 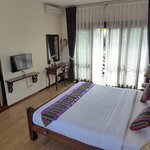 The property is beautiful, and in a beautiful setting, rooms are well appointed, each with balcony overlooking the river with banana trees and other tropical vegetation separating the individual cabins. Breakfast is an amazing array of western and dishes from the local Shan culture, all freshly prepared and delicious. We ate a number of delicious meals for lunch and dinner here as well (the Shan set menu is a tasty treat of several different local dishes). If this were not enough, the staff is most wonderful -- always friendly and helpful, whether suggesting trekking options for day-long and multiple-day tours they conduct, or inviting guests to parties on site (during our stay there were two: a New Year's Eve party and an Myanmar Independence Day/birthday party for a staff member). We took a self-guided tour to a beautiful waterfall suggested by the lodge staff, and enjoyed walking through the countryside, past village huts with ingeniously-devised hydroelectric power. Our guide on two outings was Aungcho, a delightful young man who works at the lodge when he is not guiding. He took us to his village on a mountaintop a couple hours away by motorbike, where we visited homes of his parents and neighbors. Another day we took a boat ride and then hiked to several villages, where we explored a monastery and had a delicious lunch. The lodge is run by MiMi, daughter of Mr. Charles, who visits the lodge each morning to chat with guests. 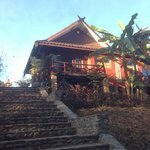 The family also owns a hotel and guesthouse in town, but this is clearly the place to stay if you like quiet and being close to nature. Highly, highly recommended! Room tip: All rooms are nice. 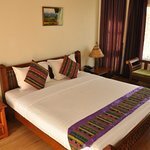 This place is about 15 mins out of Hsipaw but the owners offer lifts to and from town. We rented motorbikes in town. I would recommend. The lodges themselves are pure relaxation. Clean, well stocked and hot refreshing showers. The food is not the best else would give this place 5 stars. The staff are really helpful and made sure we got the most out of our 4 day stay. Highly recommend.